Rivet shelves aren’t just customizable in the sense that shelf heights can be adjusted to whatever you’d like them to be. You can also select the type of decking you would like used in them. Basically, decking is the surface of the shelf. When you put something on a shelf, decking is what you set it on. There are three main types of shelf decking to choose from: wire decking, wood decking, and steel decking. The type of decking you need depends on what you’re planning to store on your new rivet shelves and what type of environment you’ll be using the shelves in. Wire decking might be a necessity depending on what you’re planning to store. If you’re storing something highly flammable, wire decking makes it possible for sprinklers to quickly put out a fire if one suddenly breaks out, so having wire decking could possibly help you get a break on your insurance premiums. 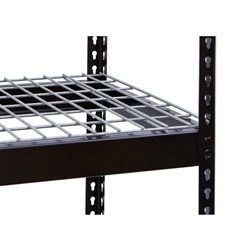 Wire decking might even be required to comply with local fire codes. Wire decking also doesn’t trap dirt in and allows air to circulate around objects, making it ideal for storing things that require ventilation. Depending on the deck size, our wire decking can hold up to 1,800 pounds. Wood decking is a great choice for most purposes. It’s made of particleboard, making it affordable and durable; a very popular option. Depending on the side of the deck, it can hold between 600 and 1,000 pounds. For maximum durability, steel decking is the way to go. They can hold up to 1,000 pounds per shelf, depending on the size of the shelf. It’s not quite as economical as wood decking, but steel decking will hold up for years to come. 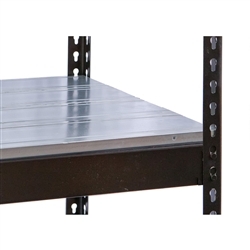 If you’re interested in steel decking, it needs to be used in center-supported double rivet shelving.